Breast cancer is the biggest threat to women all over the world yet we don’t know much about it or how to detect it early and save lives. In India, for every 2 women newly diagnosed with breast cancer, one woman is dying of it. Numbers obtained from a comparison report of breast cancer in India with the US and China for the year 2012 highlight that India has the maximum number of women dying of breast cancer as compared to the US and China despite both countries having more number of women diagnosed with breast cancer than India. Women affected in India usually turn up at the later stages when the mortality rate is higher. Several reasons have been found as to why women in India turn up late to the doctor, of which the major ones are lack of awareness, shyness on part of patients and social stigma. A basic mammogram (an X-ray of the breasts) is recommended for all women over the age of 40, to help catch breast cancer early. Studies have proved that when breast cancer is detected before it has spread to lymph nodes, the five-year survival rate in many countries is now well over 90 percent. The need of the hour is awareness and as October is ‘Breast Cancer Awareness Month’, Philips India has initiated a breast cancer awareness campaign to be led by husbands, in association with its agency, Ogilvy One. The campaign titled as ‘Husbands initiated Movement’ or HIM to fight breast cancer has a 2-minute film at the core and is supported by a microsite. 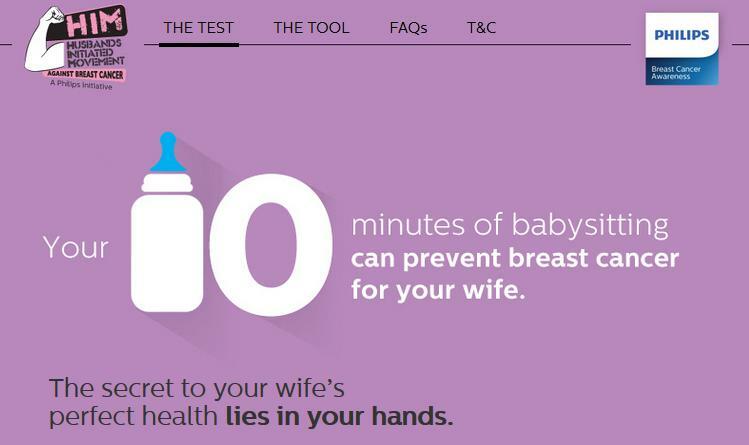 It aims to educates women on how to do a 10 minutes breast self-examination test at home while encouraging the husbands to get their wives to do it. Produced by Cutawayy Films, the film titled ‘The Silent Couple’ portrays a beautiful married couple who communicate through sign language. The husband wants his wife to take 10 minutes out from her busy schedule between work and family, so she could do the breast self-examination test. He comes home early one day and starts to cook, a chore that his wife has been habituated to after returning from work. When she returns home to find out that he has been cooking, she gets terribly upset and communicates her frustration of having to clean up the mess he will make. He hands her some papers containing steps to do the test, and she takes a while to absorb all this. He then gestures her to do the test right away while he carries on with the cooking. The film ends with, ‘Because actions speak louder than words…Do one chore your wife does’. The film has been well received with over 77K+ views in over 3 days. The microsite provides the steps to the breast self-examination test along with a helpful document you can download and FAQs. A breast cancer risk assessment tool tells you what are the factors to look out for when it comes to age, family history, lifestyle and estrogen exposure. Husbands can share information with their wives via email or share their emails so required information could be emailed to them. A Facebook share button enables one to share the page with their Facebook friends. Philips has also carried the movement onto social media by incentivising it. Husbands can pledge their support and click a selfie while they do the household chore and upload it on Facebook, Twitter or Instagram with the hashtag #HIMInitiative. 5 posts with the maximum number of likes or favorites stand the chance to win Philips Airfryer and many other top likes or favorites may get gifts from the brand. The film hits the issue at the core. Married women hardly pay attention to their own self and are constantly on the move keeping their family well fed and healthy. Asking husbands to free their wives for ten minutes by taking up one of her chores, could be a crucial beginning to raise awareness on breast cancer. The beauty of the concept is further supplemented by the sign language being used to communicate the message. Words are truly unnecessary as actions speak louder than them! The site provides very useful information on breast cancer that not only empowers one but also advises on necessary steps to take caution. The downloadable document, ability to share information through email or Facebook along with the film makes for a great digitally-led awareness campaign on breast cancer, something that is the need of the hour and needs more people talking about it to eradicate the social stigma involved and save our womens’ lives. Pinkathon Kicks Off To A Great Run On Social Media Too!